While roads and platforms are increasingly full and waiting lines for billing are lengthened in the airport terminals ... the crisis does not stop at the bus stations. This type of long distance travel was the only one that suffered a loss of travelers in 2018 despite the general improvement of the Spanish economy, the transport sector and the bus itself, which does improve in the urban area and in the displacements of short and medium distance. Why is the long distance bus still in crisis? The key is in the statistics on travelers published yesterday by the INE. While long-distance bus movements fell by 4%, the AVE and long-haul railroads rose by 3.8% and 4.1% respectively. «In recent years we have suffered a very aggressive commercial policy of Renfe promoted by the Government itself. The train has dropped prices and has entered our market niche making competition very difficult, "explains Rafael Barbadillo, president of the employers Confebús. The long distance bus has lost more than 350,000 travelers since 2009, date from which the statistical institute offers the first registration. It is 22%, that is, almost one in four customers. In the same period, the long-distance railway has gained 700,000 users. From Confebús insist that at the end of last 2018 began to be observed and the first green shoots in the sector with three months of consecutive passenger increases. "The bus crisis came later because we are traditionally the cheapest means of transport. And now it is true that we are being the ones that take longer to leave, "says Barbadillo. The sector is focusing its efforts on the technological renewal of its fleets that holds young people and stops their jump to the train or to the new alternatives of displacements such as BlaBlaCar. However, the president of Confebús believes that the future of the sector depends on the integration between both modalities taking advantage of the territorial dislocation of the railway. «We arrive where nobody arrives. The solution goes through intermodality: have a ticket with two tickets. For example, a train from Madrid to Valencia with the bus connection to Denia ", explain in the employers' association. 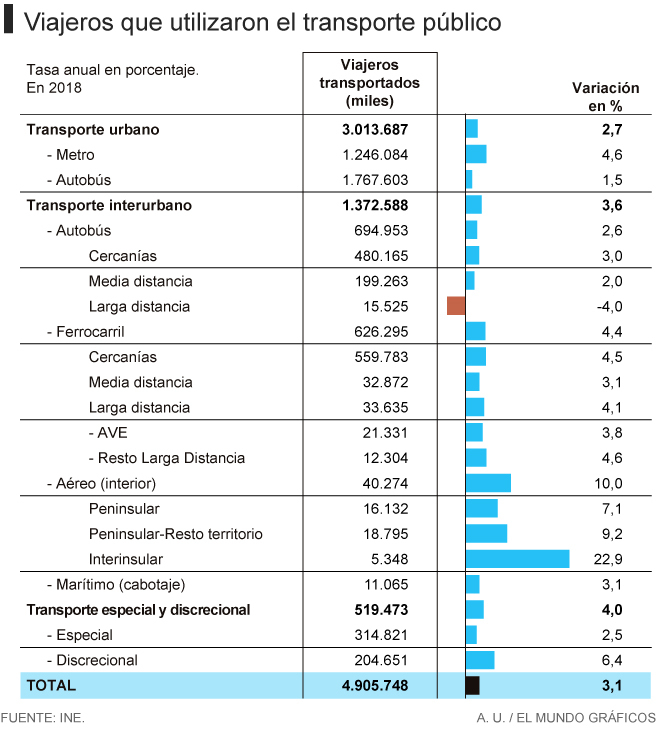 The loss of customers on the major routes contrasts with the improvement of this transport in the urban area (+ 1.5%) and the intercity one in nearby and medium distance, where it grows 3% and 2%. This growth is mainly linked to the improvement of the economic situation -more displacements due to work reasons- and the problems linked to rail commuter trains in large population centers. However, the great winner one more year of the statistics of travelers is the plane. The internal displacements by air grew by 10% and once again broke their best records, already registering an increase of 48% since 2013. The figure doubles the growth experienced by the AVE itself, although the comparison also includes island destinations where the railway It can not arrive. As a whole, the movements of travelers in 2018 recorded the largest increase in the historical series with a rise of 3.1%, boosted by the overall improvement in the economic situation and a record in the arrival of tourists, which exceeded 82 in 2018 . 6 million visitors In total, more than 398 million trips were recorded in the country, a figure similar to the one recorded in 2008. The figure is already 12.5% ​​than the worst statistics recorded during the crisis.